Hunting in Maine is no easy task. Big woods bucks are tough to kill and they live in some of the densest forests in the country. This lucky hunter, Alfred Bowden Jr., was able to score on this giant buck, a 274 pound pig. 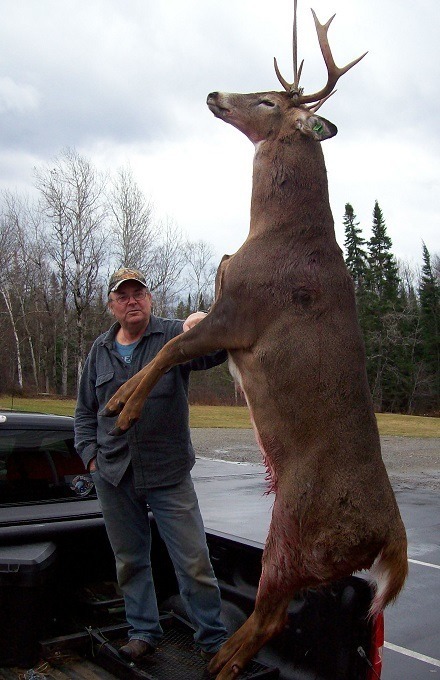 Bowden shot the buck in the Jackman, Maine area and didn’t believe the scale when it showed 274 pounds, so he went and got another. The second scale showed the same weights, so he finally was a believer. What an awesome and huge deer. The 8 point buck was measured by Bowden and from the horns to the hooves was nine and a half feet tall! Congratulations to Bowden on an awesome Maine buck. Send us your deer hunting photos and stories to PJ@MorningMoss.com and we’ll post them on our user submission page. See more big buck hunting tips here.